The history of branding and marketing shows how durable are well-established brands. Once a reputation is earned, the names can continue for a long time in the folk memory, even in decline and even when defunct. Sometimes, only an event out of the blue can kill a brand. Instances abound. Dow Ale was fatally wounded in the mid-1960s by a scandal involving the deaths of a score or more heavy beer drinkers, thought to be done in by a foam-enhancing additive. I probably get more views on my 2016 Dow Ale post than any other. People still remember, or know somehow, the name Dow even though the product hasn’t been sold since about 1990. Coca-Cola was almost fatally hurt when the flawed New Coke version was introduced, but white knight Coke Classic saved the day. Schlitz beer, mentioned in the above ad, was later afflicted by a mistake in processing that changed the palate. Sales dropped and even though the error was fixed sales never recovered. But when no unusual difficulty besets a popular commercial product it can live for 100 years and more. Consider the drinks ad reproduced above (top left portion), obtained via New York State Historic Newspapers, here. 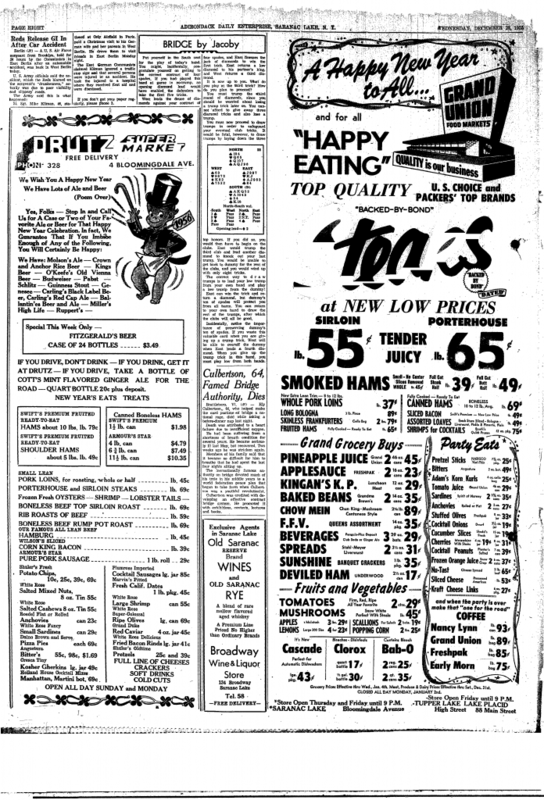 Drutz Supermarket in Saranac Lake, NY placed it in 1955 in the Adirondack Daily Enterprise. Saranac Lake was and remains a well-frequented tourist and vacation destination in the Adirondack Mountains. Of the 16 beers in that list 13 still exist and most do quite well in the market. Only Ruppert, an old name in New York City lager, Kingsbeer, a Canadian lager in the Dow family, and Fitzgerald’s beer have departed the market. 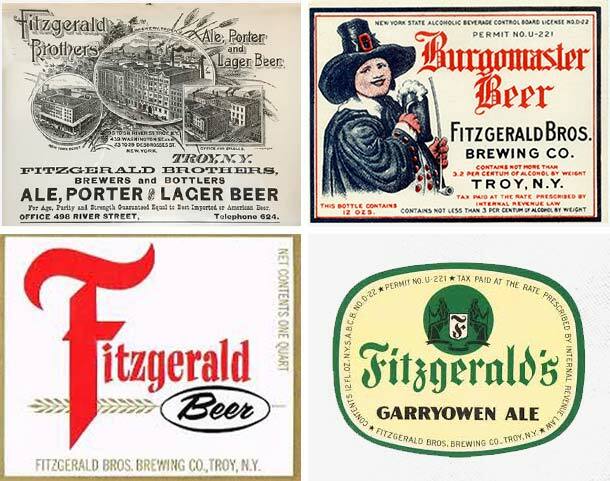 Fitzgerald was a long-established brewery and soft drinks distributor in Troy, NY, a comparative hop and skip from Saranac Lake. The Fitzgerald brewery lasted until 1963. The beer, or at least the one advertised, was what was known then as a “price” beer, not the most premium, that is. (For good background on Fitzgerald read Jay Brooks’ 2017 essay, here.). But look at the other names, e.g., Carling, Guinness, Budweiser, Ballantine, Pabst, Miller High Life among others. All top end at the time. And then there is Crown & Lager Rice Beer. What’s that? It was the lager of Quebec-based Molson Brewery when it first expanded in Toronto (from Montreal), in 1954. Numerous sources state that this beer was rebranded in 1959 as Molson Canadian. Well, Molson Canadian needs no introduction to Canadians and indeed many beer drinkers beyond today. But can good old “Canadian” really have rice in it? Malt adjunct, certainly but rice? Its predecessor, or predecessor in name, clearly did. 1950s brewing was a time when marketers could be ingenuous, and even vaunt such things with pride. No one told the public then – there were no consumer beer writers to do it – that rice in was an American innovation that arguably detracted from lager’s traditional palate. So why not trumpet it? Anheuser-Busch had done so, before WW I, trying to distinguish rice from corn adjunct, but after 1933 did not try the gambit again. I don’t think the rice claim – rice lager – was so much turning a negative into a positive as not realizing rice adjunct was not, in terms of traditional brewing, a point of pride, even in America where some form of adjunct characterized most brewing by 1900. 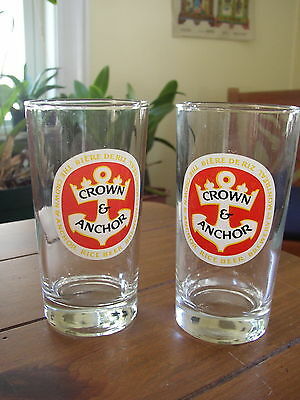 In fact, there seems to have been an attempt by Molson to create a fresh image in Ontario, almost to give the impression the (unit name only) “Crown and Anchor Rice Brewery” on the label was a new entrant in Canadian brewing. Maybe it was thought “Molson” had no particular resonance in Ontario, or was viewed negatively since Molson originated in Quebec. (The old Quebec-Ontario rivalry lives on). Indeed the word Molson does not appear on the Crown & Anchor label. Today people knock big brewers for setting up “Potemkin” breweries, fake units dressed up in craft livery meant to gull the public. So it’s not really new, is it? 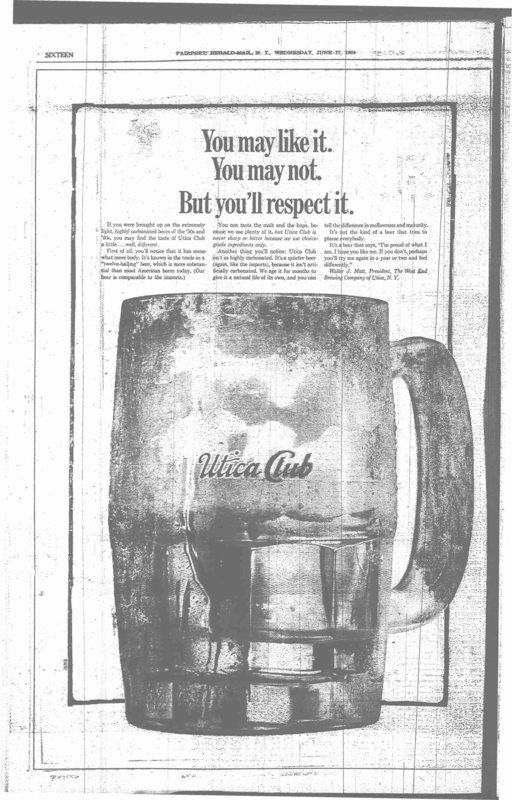 Be that as it may, Molson discarded the artifice after a few years, and discarded the rice claim, too. Perhaps it got letters from European brewmasters skiing in the Adirondacks saying, “Vy are you fellows advertising the use of rice? Vy is it in the brewery name?”. So, yes, even Crown and Anchor Rice Beer still exists, only it’s called Molson Canadian lager beer. Therefore, Crown & Anchor and Rice Lager were not destined for the ages. But the brewery that made it, the venerable Molson, still exists, as Molson-Coors, and Molson retains largely the magic it has had in Canada since the 1800s even though the main brands of Molson-Coors have no particular cachet in beer aware circles. Note re images: The first image above was sourced from the news story linked in the text. The second, from Ebay, here. The third, from the Fitzgerald Brothers website (the bottling and distribution business still exists), here. All intellectual property in the sources belongs solely to the lawful owner, as applicable. Images used for educational and historical purposes. All feedback welcomed. The Trappist (Cistercian Strict Observance) Mount Saint Bernard’s new brewery in Leicestershire, U.K. is now operating. This is a major development in both U.K. and international brewing circles. 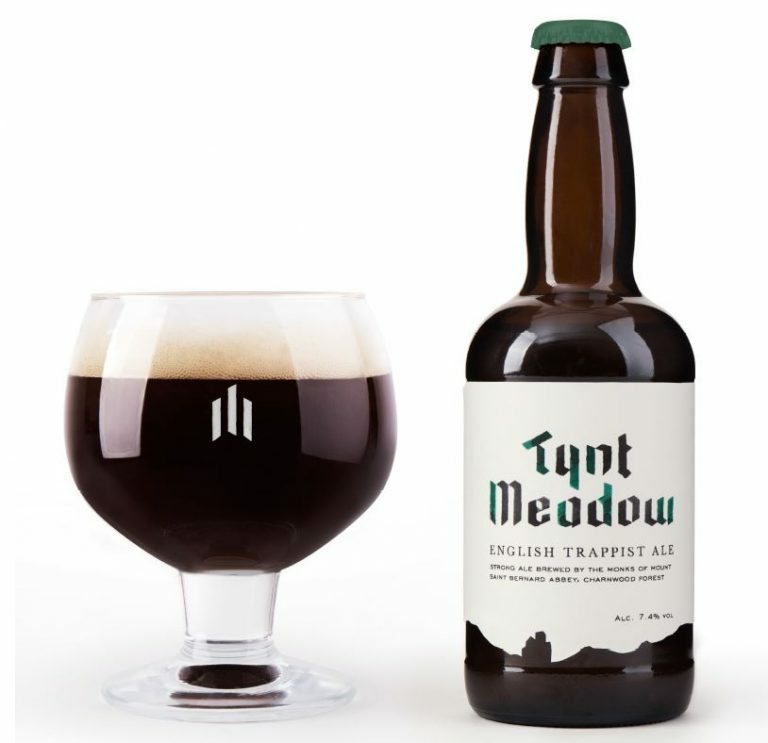 The first and only beer to be released is Tynt Meadow, named after a patch of land where the first monastic arrivals in the area built shelter until removing to premises in nearby Charnwood Forest, Coalville, Leicestershire. This page from this abbey’s website gives full information on the monks’ vocation, the brewing project and underlying aims, and how to source the beer. It is available in bottled form only and bottled with its residual yeast, a technique at least hundreds of years old. Such “bottle-conditioning” is not dissimilar (in substance) to the part of Champagne production that generates the famous fizz. Champers is said to be, pleasingly in this context, of monastic origin via the historical originator, Dom Perignon, although the story may be mythic or in part. Mount Saint Bernard beer sales will help support the trust that funds the abbey’s activities, promotes its good works. The brewery is one of only a dozen authorized to use the Trappist designation. Most Trappist breweries are in Belgium with a scattering in other countries, including now the U.K.
First reports indicate a rich brew of traditional English character. As the web page makes clear the beer is mashed and brewed from all-English materials including malt, hops, and yeast. We were very glad to read this and had called substantially for this style of beer in our 2016 essay discussing the history of brewing at the abbey, here. While it is doubtful this type of beer was made at Mount Saint Bernard in the 1800s vs. the low-alcohol, “small beer” I discussed in my 2016 post, earlier monastic brewing history suggests a full-strength ale was made in the U.K. that influenced European monastic brewing before the French Revolution. This earlier tradition, as deployed notably at the Benedictine Dieulouard abbey in France before the Revolution, had to in our view in turn influence the strong beers made at the Belgian Trappist monasteries post-Napoleon. See my earlier posts cited in the 2016 post that discuss this earlier history. Needless to say the beers once “Europeanized” evolved over the generations. In particular, a Belgian Trappist yeast signature emerged, possibly too in association with the typically high ale fermentation temperatures used. The impact on palate is quite different, for the most part in our experience, to that resulting from current English brewing yeasts and fermentation practice. The Belgian yeast signature is a chalky, clovey note whereas English yeasts generate a range of flavours from mineral notes to soft black or other fruit character. I realize this is generalizing and doesn’t take account of factors such as water profile but still this bright line can be drawn in my view. Regarding the true nature of the beer brewed (or sourced, perhaps) by Mount Saint Bernard in the 1800s, I should add that quite possibly it brewed a typical, 7% abv “first mash” strong ale but diluted it for service in the refectory. If it did brew such a beer, the new one just issued can be said to follow more directly in its footsteps. As pointed out in my earlier posts, there is evidence that strong beer in the abbey tradition “supported” dilution, meaning sometimes it was cut with water to reduce the alcohol. Until such time as 1800s’ Mount Saint Bernard brewing records surface – apparently the monastery can’t locate them – the precise character of the monks’ beer in that century can’t be known. Nonetheless, as I documented earlier, from 1842-1890s numerous visitors to the abbey recounted that a small beer was served with the meals; we know that much. Any way one looks at it, the type of beer Mount Saint Bernard has decided to brew in 2018 is fully within the relevant traditions. And, it offers a (welcome, in our view) change from the typical Trappist/Abbey/Belgian ale palate. To be sure, Orval Trappist Ale, for its part, does not have the typical yeast background of Belgian ale including Trappist and Abbey beer. By “Belgian ale” I mean, apart the Trappist and Abbey beers, mainly saison, grisette, De Koninck in Antwerp, golden ale (Duvel and similar), and the non-specific Palm Ale type. The West and East Flanders red and old brown styles divert from this palate due imo to their lactic component. The wit style does too because of its raw wheat and spices, so does lambic and its derivatives due to the cocktail of fermentative organisms. In a witty exchange today on Twitter among beer writers Adrian Tierney-Jones, Melissa Cole, John Porter and others, a new Beck’s beer package was discussed: a can of Beck’s dressed up as a champagne flute. The new can, called Le Beck’s, was created … in a bid to “earn an enhanced premium perception”. …. Beck’s … claim[s] that the cans are “a first in world beer packaging”. The inspiration behind the packaging was to bring canned beer to venues and events where it is not traditionally consumed. As a result, the Le Beck’s cans have been trialled in art galleries, classical music concerts and other “exclusive” events in Germany. 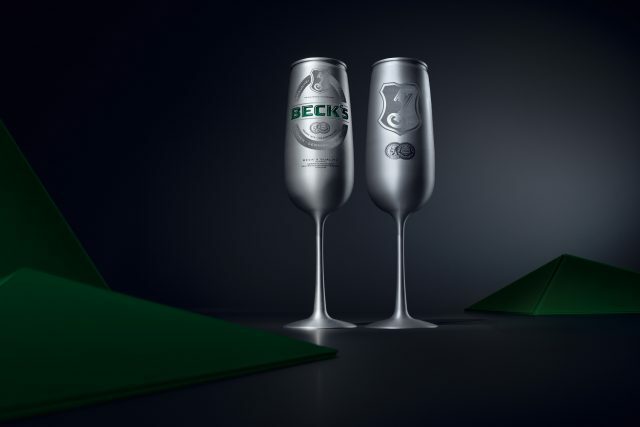 Due to the “overwhelming response” Beck’s is now considering launching the beer flutes globally. I posted a reply to the tweets stating I recalled reading of a Lowenbrau ad from long ago which stated: “When you’re out of champagne, open the Lowenbrau”. I said maybe Beck’s has a long memory, which got a smile or two. Either formulation – my apparently erroneous one or the documented one above, gets the point across: Lowenbrau is the beer equivalent of the most famous wine in the world. 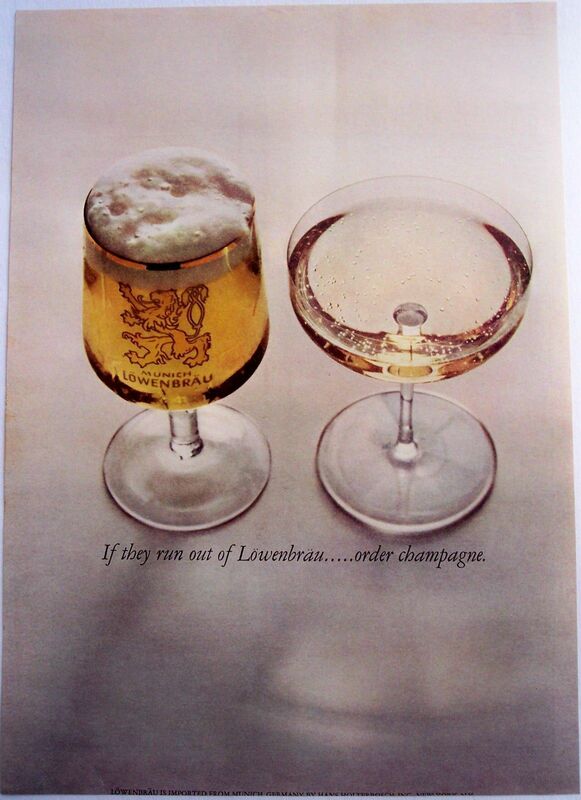 Still, I’m wondering if Lowenbrau perhaps did run the line as I recalled it in an earlier period, pre-WW I to my recollection, and a 1960s ad agency reversed the wording for the U.S. market. I actually like my version better: more subtle, more honest in its mild self-deprecation. No beer however great is likely to challenge champagne for luxury but if you run out when celebrating open the Lowenbrau, a great beer to follow the best wine in the world. So I’ll continue the research, but for now it’s the version pictured above that Lowenbrau ran. And certainly it did great work to sell the beer. Brian Tracy in his book Victory! (2002) states how the campaign turned a previously languishing product into a star import, see here. Note re images: The first image was sourced from the drinksbusiness.com news story linked in the text. The second was sourced from an eBay listing, here. All intellectual property in the images belongs to its lawful owners, as applicable. Images used for educational and historical purposes. All feedback welcomed. In 1963 Joseph Griesedieck, Sr. (“Joe Sr.”) was the third in paternal line to head up Falstaff Brewing Corporation in St. Louis, MO. He chaired its Executive Committee and was on its Board of Directors. Griesedieck, an engineering graduate from Cornell University, had started as a trainee in the fermentation and brewing halls and by 1963 was in senior management. He authored that year an article in the Financial Analysts Journal, here, another gem from the JSTOR scholarly research resource. It is called, Brewing Crosses the Threshold. His audience: financial analysts who reviewed industry groups and publicly-listed securities for the investment industry. Clearly Joe Sr. wanted to impress this sector with the recent growth and bullish prospects of the brewing segment and his own company, which was traded on the NYSE although still family-managed. The article is upbeat, confident, and secure in its feeling the American brewing industry had many sunny years ahead, and by implication Falstaff as one of its leading lights. 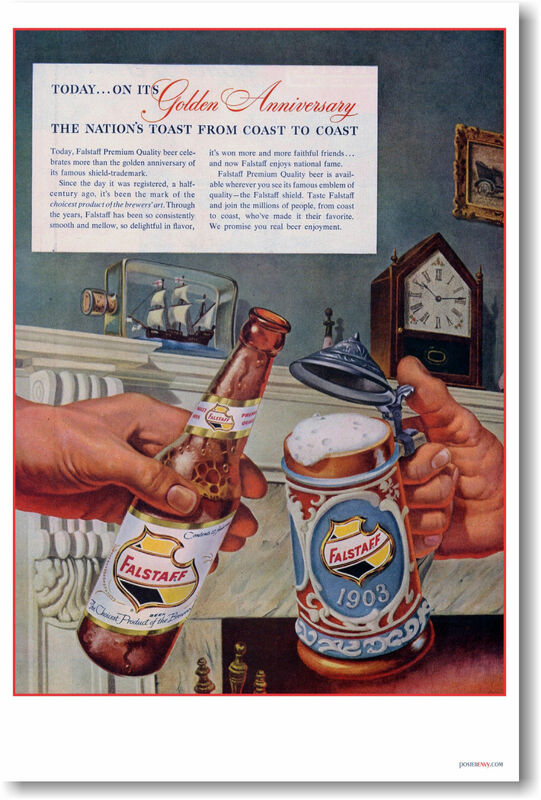 In 1963 Falstaff was the third-largest brewer in America selling 6M/bbl per annum. It had built a stable of breweries by acquisition, reaching into different parts of the country. The Griesediecks were a clan originally from Catholic Westphalia who came to America at the Civil War’s end. They started in malting and then brewing, running a number of breweries under different names. American patriarch Anton fathered Papa Joe, Joe Sr.’s grandfather, and it is Papa Joe who laid the post-Prohibition foundation of Falstaff. He had purchased the iconic St. Louis brand from another brewery, Lemp, that had stopped operating with the advent of Prohibition. Papa Joe had confidence that Prohibition would one day end and he would return a famous beer to the market. In the years since the hardy pioneers quaffed their homemade brew, beer has had its ups and downs. Some of the downs, particularly prohibition, made the going pretty rough. In fact, with repeal, a complete industry was – in effect – born anew. Changes in consumer habits and distribution methods had to be caught up with at the same time the industry was analyzing the changes of the future. There have been many such changes. Among the major ones are the rapid rise of the supermarket as a family shopping center; the growth of convenience packaging and cash-and-carry trade; the increasing popularity of beer among women and its acceptance as a family beverage of enjoyment and moderation; and consumer reliance on national and semi-national brands for quality and dependability. …. During these recent, somewhat hectic years, competition in the industry has been honed to scalpel-sharpness, forcing some marginal and less efficient brewers to throw in the towel. To survive, brewers have had to demonstrate flexibility in meeting changing marketing conditions. And successful marketing has had to have the backing of strong management leadership. The total effect, however, has been a strengthening of the relative positions of the brewers who have operated profitably during this period, plus a new status – a “streamlined look”- for an industry that traditionally has been regarded as a bit old-fashioned in its development. Today, scientific management methods are as much a part of brewing technique as the fermentation processes. The men who make the beer are a young and energetic group, specialists all, and the tools with which they work are the most efficient to be had. Electronic data processing has been harnessed for brewing efficiency. At Falstaff, for instance, orders from all eight breweries funnel to a control center in St. Louis over leased wires. Here EDP takes over verifying the accuracy of orders, signalling urgent needs for materials and supplies, and arranging a weekly production schedule for each plant exactly tailored to each week’s demand in each distribution area. Joe Sr. also noted the ongoing consolidation trend but saw it as a positive, to realize efficiencies in the face of ever-rising costs and taxes and ensure the capital investment vital to remaining competitive. He noted that many smaller concerns couldn’t keep up and fell by the wayside. He doesn’t give any hint of being worried his company would be taken over. Rather, it was the other way around: Falstaff had regularly acquired breweries, including a modern St. Louis plant in the mid-1950s owned by cousins, the Griesedieck Brothers Brewery. But fate intervened: in 1975 a controlling interest in Falstaff itself was purchased by Paul Kalmanovitz, the premier U.S. brewery corporate raider of the time. “Mr. Paul”, as his employees called him, invested $20M in exchange for one-third of the equity and, crucially, voting control. By 1977 Mr. Paul shut the St. Louis head office and brewery of Falstaff, firing most of the workers and managers. The surviving management was moved to San Francisco, CA to work with Mr. Paul’s General Brewing which had absorbed Falstaff. Falstaff’s farther-flung breweries were closed in subsequent years. Thenceforth Falstaff beer was manufactured in another of the breweries later acquired by Mr. Paul. The last to be bought, Pabst, is still a successful, mass-market brewer albeit owning no significant brewing operations: most production is contracted out. Mr. Paul died about 20 years ago and other hands now own Pabst. Falstaff beer itself has been off the market since 2005. Joe Sr.’s son Joe Jr. headed Falstaff when Mr. Paul took it over, fourth in the family line to do so and last to run the business. He survived the cull of management and went out to San Francisco to join Mr. Paul. Some of the drama associated with the takeover is described in the article “The Falstaff Brewery, St. Louis” by Chris Naffziger, published in Brewery History in 2015, see here. 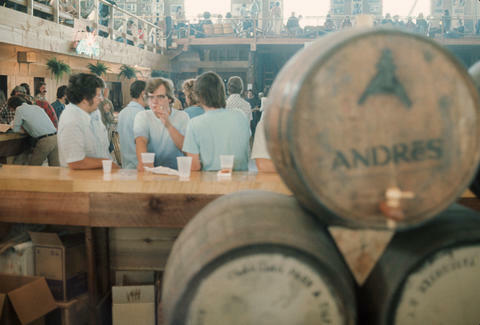 According to the article, by the early 1960s the seeds of Falstaff’s fall were sown in that the company had bought aging breweries whose per-barrel production cost well exceeded that of highly efficient breweries such as Anheuser-Busch. Falstaff began its attempt to expand into the Northeast United States, purchasing Ballantine in New York and the Narragansett Brewery in Rhode Island. Disappointing sales of Ballantine and an expensive, if ultimately successfully defended, anti-trust lawsuit in Rhode Island further sapped Falstaff’s finances. Ironically, the logic of survival of the fittest advanced by Joe Sr. in the 1963 article, when Falstaff seemingly was impregnable, did the company in a scant dozen years later. In terms of beer itself, as a drink, there is not a single word in Joe Sr.’s article, that is about its taste or the different styles of beer. Beer is assumed to be a given thing, with national brands having the highest quality and appeal. The interest and challenges lay in other areas, with the goal of economic efficiency foremost. Fermentation and brewing are mentioned briefly but only as subjects of further refinement by scientific processes. The article reflects the perspective of the committed business technocrat. There seems some affection for beer whose long history he outlines briefly. But he implies that the lore of the brewmaster and his special skill is more for public consumption, i.e., its marketing value, than anything important. Joe Sr. did hint at a major business breakthrough, one he was not at liberty to discuss. Perhaps it dealt with continuous fermentation, heavy brewing, or some other technological innovation. More plausibly perhaps, the future purchase of Narragansett Brewery in Rhode Island was already being planned. He certainly did not envisage the craft revolution and that rich, heavy-hopped beer, the type Griesedieck ancestors made in the 1800s, would return to American brewing and enrich (some of) its innovators. Yet another irony: Ballantine India Pale Ale, an important progenitor of American and world craft brewing, was in the Falstaff stable from 1972 due to Ballantine brewery purchase by Falstaff. Of course, Joe Sr. was not alone in viewing beer this way. Mr. Paul, for this part, never moved in that direction either with no evident harm to his interests. Such was the temper of the times: no one was thinking of “the beer” except to have white-coated scientists make it at the lowest possible cost. In fact, most U.S. beers by then were rather peas in a lager pod. In the Brewery History article a brother of Joe Sr., a Monsignor (in the priesthood), expressed bitterness at Mr. Paul’s ruthlessness, and derision for what he viewed as his uncouth manner. Joe Jr. was also interviewed extensively but is more nuanced in his assessment of Mr. Paul, a man he clearly admired in many ways. Chris Naffziger sums up the antimony as the perspectives of morality vs. business. As someone who has been involved in the business world for decades, I see it like Joe Jr. Business is a complex process, never completely amoral, never completely profit-driven. Different businesses reach a balance suitable for them but at a certain point, sustained profitability is a sine qua non. As Naffziger notes, maybe the right way to view it is Mr. Paul did the dirty work no one else at Falstaff was willing to do and had he not done so, the company would have gone under anyway. I wonder if Joe Jr. had his father’s 1963 article in mind when assessing the legacy of Falstaff and the various responsibilities for what went wrong. N.B. Some years ago Griesedieck descendants in St. Louis founded a business to offer St. Louis two beers under their name and the “GB” shield used by the old Griesedieck Brothers Brewery (both made under contract, I understand). See details in their website here including some absorbing history on their brewing ancestors and Falstaff. This is a commendable continuation of important local brewing history, related to Falstaff Brewery but not using the Falstaff brand as such. The name still belongs to Pabst. Note re image: Image sourced from eBay, here. All intellectual property in the image belongs solely to its lawful owner, as applicable. Image used for educational and historical purposes. All feedback welcomed. Recently I talked about Beck’s beer, historically in terms of its true style but also its current profile. In a series where I will revisit classics from 40 years ago – from the time that is when beer critique first assumed modern form – let’s look at Spaten. The one we get is the Helles, the regular, pale-coloured lager of the house that is a standard-bearer of Munich brewing. Spaten makes a Pilsener too, hoppier in character, a Dunkel, a Bock, and various other types according to the Beer Advocate rating site. The German site for the brewery mentions (if I read it right) only the Helles (called Hell there), an Octoberfest style, and an alcohol-free but the rating sites list a much broader range with quite current reviews. Of course too Spaten was always associated with a noted wheat beer, Franziskeller, but I won’t deal with that here. Spaten until 2003 was family-owned, since then it is in the powerful AB InBev family of breweries. 1970s and 80s American beer books describe the Helles as heavy-bodied and very bitter. While it is always hard to know if beer changes over such a long period, or if a relativity factor is at work, I’d suggest the Helles has gotten lighter. But when you get it in optimum condition, as the sample shown – it is about 90 days from packaging – it can be very good. There is a barley sweetness to it, a light, interleaved bitterness, and subtle notes of lemon and earth. The sample has no swamp gas or boiled veg notes, the tell-tale DMS (dimethyl sulfide) of so many Euro lagers. It’s a taste old-time learning suggests should be aged out in blonde lager. But so prevalent is it – even some mass-market North American beer has it, PBR and Molson Canadian, IMO – it must be accepted as a trait of lager brewing. It comes from a precursor in very pale malt. 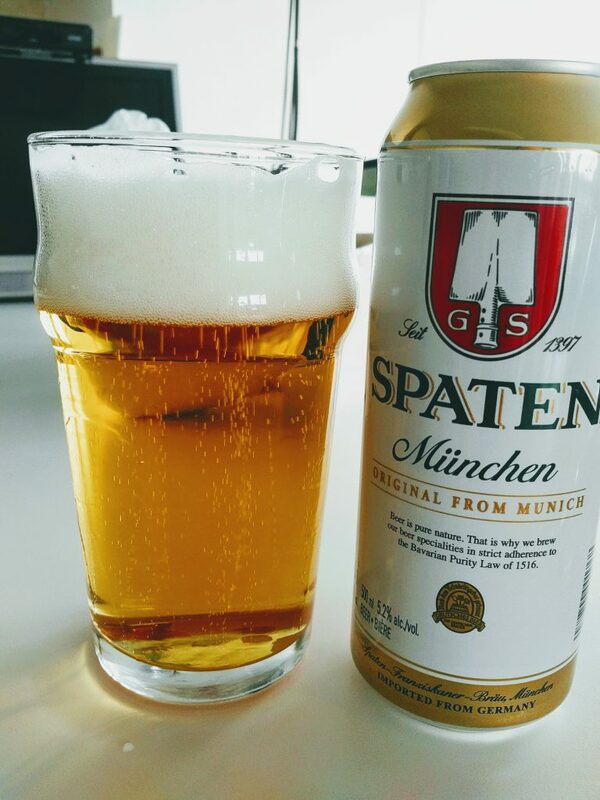 I know I’ve had Spaten as fresh and possibly even newer than this sample with seemingly strong DMS. It’s sometimes called in beer description grassy or hay-like. Read online reviews for many German lager imports, or Heineken, or Grolsch, etc., and you will see terms like this used, and sometimes “skunky”, often mistaken for the DMS taste. But this sample doesn’t have that. I think the beer probably differs from time to time in this respect, i.e., irrespective of time in the can or bottle. Despite every precaution of science I think beer does change from time to time, not just due to inevitable variations in process but to seasonal and other variations in ingredients. Even well-known brands can vary more than most people think. Because it’s in a range not material for the average consumer it’s not an issue from a sales standpoint, but experienced tasters can pick up on it. I opened this can at room temperature and it tastes great. Later, I drank a second half of the can cold, which brought out other features: an icy spring-water-like character, the equable carbonation, the barley sugar again. The hops are quite noticeable too – it’s not a vapid beer by any means but achieves its quality through balance and flair. Of course I’ve reviewed the changes floated earlier this month by the government, which given the long lead-up are likely to be final when the new rules take effect. I had submitted, to my best recollection, comments in an earlier stage of the process. It must be two years ago or more now. Just as a general or high-level reaction (not granular/legal opinion style) the process seems evolutionary and the changes reasonable. Most beer made won’t be affected but some will. Beer remains an alcoholic infusion of barley malt or wheat malt,* to which other things can be added, classically hops or extracts made from them and cereal grains (malt adjuncts) but also many other substances. It is clear once the amendment becomes law that herbs and spices can be used. The present beer standard permits use of any “carbohydrate”, which these are anyway, but clarification is provided. Adding bacteria to yeast as a permitted fermentation agent takes account of certain styles using lactic acid bacteria, so this is new. Brews with nuts, among some others, may need an allergens notice. The idea is that existing substances and new ones to be allowed in brewing may cause allergic reactions or contain gluten (dangerous for celeriacs), so the existing exemption of beer from the requirement to state these contents will be removed. (This explains the statement on some beer labels now, “contains barley”). The new four percent by weight residual sugar limit is an alternative to the present, vague requirement that beer must have the taste, aroma, and character traditionally associated with beer. It may cause a few practical problems, e.g., for some very rich beer styles such as Imperial Stout or Barley Wine. If there is one area for a re-think that’s it. The new rule applies to glucose, maltose, sucrose, and other basic sugar units, not dextrin for example. This delphic-seeming requirement is intended to mark off traditional beer from malt-based alcoholic beverages, so-called malternatives, that traditionally are much sweeter in character and not really beer-like. A factor here is, the malt is often used essentially to provide the alcohol with flavours coming from fruit or other sugars added. There is a proposed transition period that would allow brewers to continue to use the requirements under the current FDR [Food and Drug Regulations] for a period of two years [from adoption of the new law sometime next year] in order to provide sufficient time for stakeholders to make necessary labelling or formulation changes. Regulated parties may follow either the former requirements or the new requirements during the two-year transition period. At the end of the transition period, the new requirements must be applied. It is largely a regulatory area where the trade lobbies Beer Canada and Ontario Craft Brewers Association, as well as the Canadian Chapter of Master Brewers Association of America’s Technical Committee, will work closely with members to promote compliance. *An earlier version of this post suggested that wheat malt was a “bolt-on” to the beer standard. However, on checking the current standard in the Food and Drug Regulations, I note it permits barley malt or wheat malt in beer, so a Gratzer/Grodziskie, say (all-wheat malt-based, or it may be) was always legal, and the wheat malt is not new as a potential 100% mash for beer. To my best recollection, an earlier version of the new beer standard required barley malt as a component in beer, that is what I was thinking of. In various social media many in beer commentary or the industry have weighed in on the impact of the purchase by Heineken brewery of what appears to be a sizeable minority stake in Beavertown Brewery, the London, U.K. craft brewery founded a half-dozen years ago by Logan Plant. Without taking anything away from the vision and leadership of Logan, the fact that he was related to Robert Plant (of Led Zeppelin) helped create buzz in the early years; it didn’t hurt certainly. Whether Robert funded or guaranteed loans to the business I cannot say, but the connection was a cool thing that helped the overall image certainly. And Beavertown has always made excellent products by all reports with innovative packaging design and marketing. It thus functioned as a lodestar for the burgeoning London group of craft breweries in particular. Many customers and retailers invested hopes and faith in the business as a classic start-up that shined by its independence. In the wake of the Heineken deal Logan stated that planned expansion required significant new investment. After examining various financing options the sale of a stake to Heineken made the most sense, in part because it is family-controlled despite its behemoth size, and since it has the technical expertise to facilitate Beavertown’s increase of capacity. Heineken also has a stable of some 3000 pubs in Britain via its Star holding, essentially outlets for Heineken’s beers. Beavertown’s distribution could avail that network in the future but the decision to use it is at the option of Beavertown, not Heineken. So far no decision has been made. In the last dozen years or so, in the U.K. and North America, a passel of well-known craft breweries has been acquired by a sizeable international brewery. Heineken itself bought full control of Lagunitas in California after taking a partial position. A stir arises each time this happens in craft circles, and now again. The phenomenon is not new. Creemore, a lager specialist in Ontario, was bought by what is now Molson-Coors about 20 years ago. Before and since then various small breweries were purchased by large American ones or brought into various joint venture arrangements. The idea often was to give the smaller player access to the larger’s distribution network. I’ve followed the craft brewing sector with great interest since its start. But I was a pre-craft beer fan as well and budding beer connoisseur with a library of books and thirst to learn more, which I did through travel, attending conferences, and further study. There was always a beer scene, it was just smaller, and different, yes, but not that different. I yield, therefore, to no one in my respect for the sector, the risks its founders took, the risks its current practitioners face every day, and their often stellar products. But when I started this interest (mid-1970s) size and scale were irrelevant to quality. Many large brewers made fine products, some made middling, or poor. It was the same for the medium-size and small breweries that existed. Products of high grade were sought out irrespective who made them. That said, because most large brewers in North America tended ever more to a uniformity in product type and characteristics, it fell to new, necessarily small entrants to restore older beer traditions. So good beer became mainly associated with them, and an affection developed for the little train that could. But this was the driver for a process, not an end unto itself. Those who made especially good products and had good business stewardship grew quickly, Sierra Nevada is the classic example but there are many others. Hence, the beer was and for most, I think, remains the point. Beavertown’s beers will continue, there is no reason to think they will change, just as Creemore lager hasn’t changed or Lagunitas IPA. Or Goose Island IPA. Not significantly anyway, which is all that counts. In some cases too these deals result in better beer, better technically and in stability. 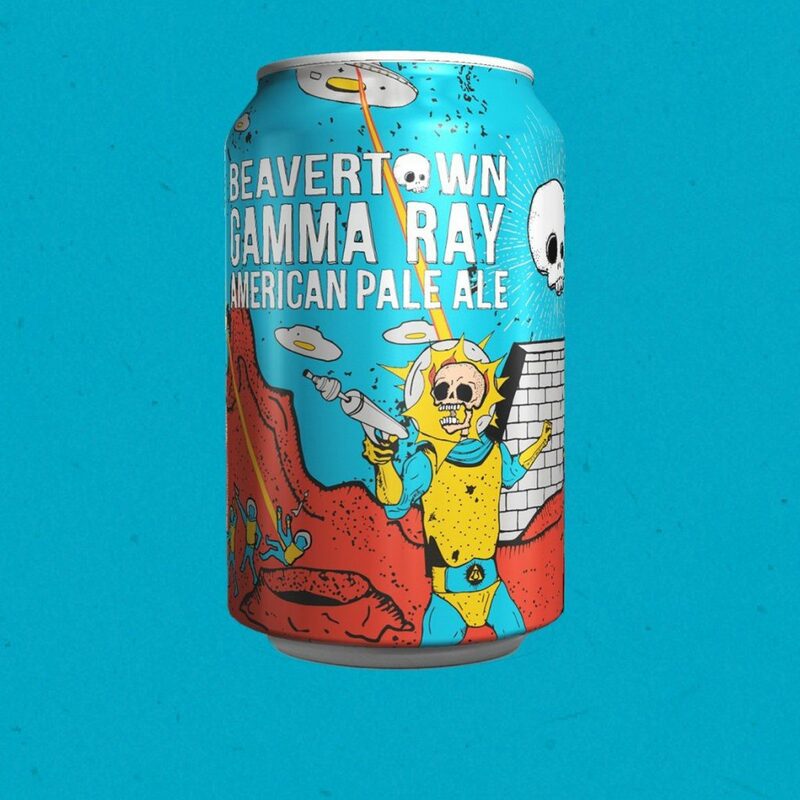 If Beavertown beers remain good and creative, more will get to buy them than now. If not, more will get the chance to say no. After some 40 years of telling big beer, “you need to make better beer”, it’s got the message. We need to take “yes” for an answer. The fact that big beer has chosen to enter the field by acquisition is neither here nor there. First, it takes two to tango, the vendors of an equity stake are as much in it as the purchaser. Second, there are literally thousands of small breweries in North America and the U.K. left to be the next pre-buyout Beavertown, Lagunitas, Elysium, etc. Or if you will the next Sam Adams, Stone, or Sierra Nevada. For those who philosophically won’t deal with a post-Heineken Beavertown – certainly their privilege – there is almost a countless number of sourcing options. The upshot is a win-win-win-win. Win 1: Logan Plant gets a payday for his hard work and vision. Win 2: The public will get greater access to his beers, probably internationally ultimately. Win 3: The thousands of remaining, fully-independent breweries have new marketing opportunities, i.e., to those who won’t support Beavertown going forward. Win 4: There is increased employment for the to-be-expanded Beavertown business and the knock-on effects. This is the business cycle in operation and in truth it was not different in the past. In the majority of larger American cities before WW I independent breweries grouped together in consolidations to survive or were assembled for buy-out by a foreign party (often English flotations). Domestic raiders, as then termed, many from outside brewing initially (e.g., E.P. Taylor, Paul Kalmanovitz) bought out countless breweries in the U.S. and Canada in the mid-20th century. The history of U.K. brewery consolidation is on record. A few early brewers survived by virtue of product specialization, e.g. Guinness (and its great advertising), or by becoming a raider, or by a high degree of technical competency (Carlsberg and Tuborg, say), or in some cases due to unusual politics – Pilsner Urquell in the formerly Communist Czechoslovakia. But they all started out like a Beavertown, young and ambitious and looking for ways to grow and stay in the game. Beck’s: a Unique Style of Beer? 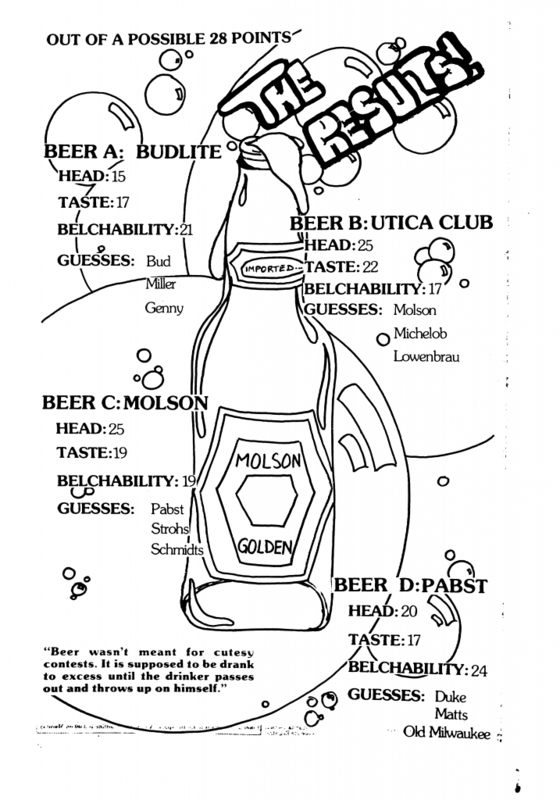 Back in 1977 Michael Jackson’s The World Guide to Beer made an éclat and included most marquee beer names then current. Not every name of renown was covered – in practical terms impossible – but most were including Budweiser, Pilsner Urquell, Bass, Heineken, Carlsberg, Guinness, Spaten, and the Munich Lowenbrau. Beck’s Beer, long a reputed export from Bremen, was included. Jackson devoted a paragraph to it, calling the beer “full-bodied and well-hopped”. He also noted the strong historic export association and stated the beer was brewed in the far east at one point. This stopped after WW II. Heineken, incidentally, also had a foreign branch brewery into the early 1940s, in Dutch East Indies. It supplied beer to America just prior to its entry into WW II. Beck’s as sold in the U.S. and Canada in the 1970s seems to have had a different formulation than for some other markets. For our market it had a lighter taste, at least according to the (fairly detailed) encyclopedia references quoted by Jay Brooks in his 2017 post on the founder Heinrich Beck, see here. …Beck’s carries no description beyond a straightforward Beck’s Bier. It is broadly within the Pilsener style with a fresh aroma, a faintly fruity, firm, crisp, palate and a clean, dry finish. It is light by German but heavy by international standards, and difficult to place in context. “Difficult to place in context” – a confounding statement from the king of beer description. Both the palate but especially the lack of a claimed style designation clearly unbalanced Jackson. Beyond allowing it was a Pilsener in the broadest terms he seemed unwilling, following the brewery ostensibly, to type it a Pils, even the German type that, while differing from Czech originals, has always been a prime international example of the Pils style. Beck was born in Baden-Württemberg in the southwest. Jackson seemed unaware of this and that Beck had emigrated to Indiana and worked in an American brewery for years. See again Brook’s discussion of Heinrich Beck’s background. Heinrich returned to Germany after some years but to the other end, in Bremen, to work at the St. Pauli brewery. He finally set up his own brewery with two others in 1873. This U.S. experience had to influence the character of Heinrich Beck’s lager. The evidence is Beck’s is notably pale like adjunct American lager, is fairly dry albeit all-malt, and not greatly hopped. This is how I remember the beer from the 1970s in Canada and it is similar today. It tastes foreign to be sure, but is one or two steps away from the domestic profile, not five. Today Beck’s, both in Germany and the U.S. where Beck’s is now produced, has issued a number of beers in different styles. Beck’s Gold, Beck’s Red Ale, Becks Pilsener 1873 are just some. Here though I am focusing on Beck’s Beer, the classic version that is still the workhorse of the brewery. Indeed AB InBev, which owns Beck’s today, claims it is the largest-selling German beer in the world, see here from its English-language website. So why has Beck’s not stated on the label that it is a Helles, or Pilsener, or Export, thus opening the door to speculation that it is a unique style of brew, not classifiable? There is an answer, and an Australian news story explains it crisply: before WW I German export brewers like Beck’s were on the march to find new markets or expand the old. Australia was prime territory. In other words, it was a Pilsener, a very good one (naturally) in the company’s eyes, as further discussed in the account. But to sell the product more effectively “Pilsener” was removed from the labels. Finally, or at least in many markets, the word lager was replaced by “beer”. It was marketing, in other words, that resulted in Beck’s seeming non-classifiable to Jackson, not the absence of a style name on the label. To the extent the palate itself bolstered that view for him, I believe Heinrich’s years of brewing in the U.S. convinced him blonde lager outside Germany should not be too malty or bitter. Beck’s still does not carry on the labels a statement that it is a Pilsener, not to my knowledge certainly. Yet, as stated above, Beck’s in Germany introduced an apparently historical Beck’s beer named Beck’s Pilsener 1873. It was released just a few years ago and is a small seller. In practical terms there is no impact on the international image of Beck’s Beer, nonetheless Beck’s had no discomfiture applying “Pilsener” to its label. Also, the website of AB InBev noted above, even for regular Beck’s, states it is a “German Pilsener”. Beck’s also markets locally in Bremen some beer styled Pilsener in its Haake-Beck line. Jackson discusses the beer in his pocket guide mentioned above and assumes (wrongly, in our view) that its “cosmopolitan cousins” Beck’s and (we infer) St. Pauli Girl, not labelled Pilsener beers, are a different style. And so, while Beck’s Beer still avoids the Pilsener term on its label clearly it is not a sui generis German lager. It started its career as, and remains, a German Pilsener, one of many Pils-type beers in the market. But the inspired label change to which A. Bergner referred in 1907 gave Beck’s an attractive singleton status. Something like this occurred with Kentucky Fried Chicken. The sometimes negative implications of “fried”, as well as a generic character implied by the full name, were obviated by adopting the name KFC – brilliant. KFC is its own thing, and many today have to think twice to remember, or don’t even know, it’s a fried-in-oil recipe. I think Beck’s must still see benefit in keeping its labels as they have been essentially since 1907. Is Beck’s a Superlative Beer? Does Beck’s deserve its reputation as a famous import? The image may have changed at least in the U.S. Many reviews on Beer Advocate and Ratebeer suggest, as do the scores, that Beck’s is viewed as average, still outside the American lager palate but (on the plus side) at an affordable price. The fact that it is brewed in the U.S. now tends to take some lustre away as well – a true import always has cachet by that fact alone. In Canada though it remains a German import. Many comments on the rating services refer to a skunky taste or smell, the presumed effect of the green bottle. Yet to me, the taste is similar on draft or in a can. I think it is probably DMS, dimethyl sulphide, that gives the impression of skunk or “marijuana”, as some state. Many European lagers have these traits as I have written frequently in the past. It is considered part of the pilsener or Helles profile especially in Germany. Not every central European blonde lager has the profile, but quite a few do in my experience. 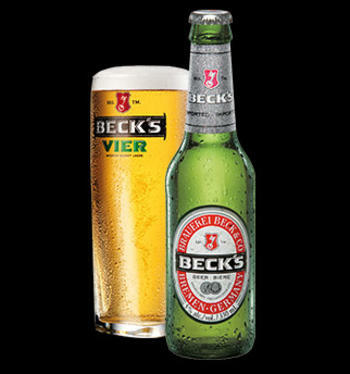 Certainly Beck’s has an assertive, fairly distinctive taste, different from the domestic lager norm or most craft interpretations but approachable (by comparison, say, to Pilsner Urquell whose palate is challenging even for many craft beer fans). Beck’s is not my preferred tipple for Pils or Helles style but clearly both in taste and image has a certain something that keeps it the No. 1 German beer in world markets. Note re image above: image was sourced from The Beer Store webpage for the brand, here. Used for educational and historical purposes. All intellectual property in the image belongs to its sole owner. All feedback welcome. Habitat Forum was a private initiative largely the vision of Al Clapp (d. 2013), a broadcaster and activist. Clapp played a large role as well in founding Granville Island in Vancouver, a revitalized, mixed-use urban space. 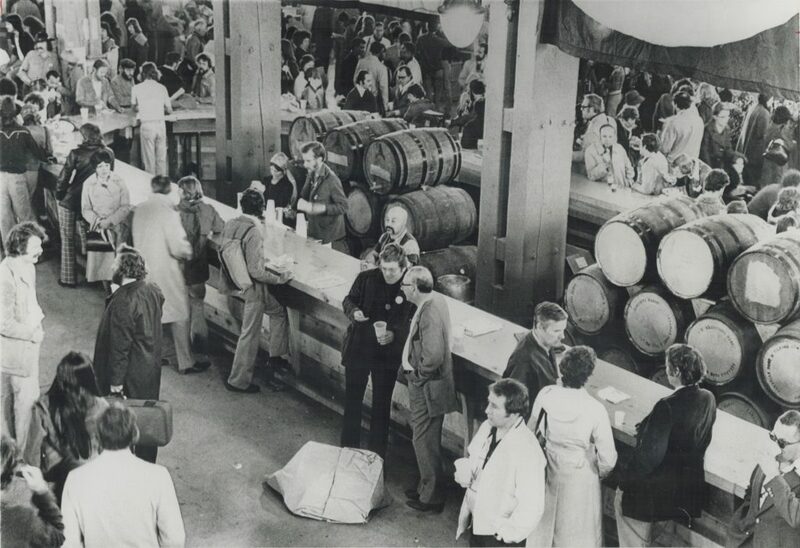 The internationally known locale also birthed Granville Island Brewery, an early entrant in the craft beer stakes. It still exists, owned today by Molson-Coors. Most people remember him as the guy who built the Habitat Forum in five derelict Royal Canadian Air Force hangars down at Jericho Beach. 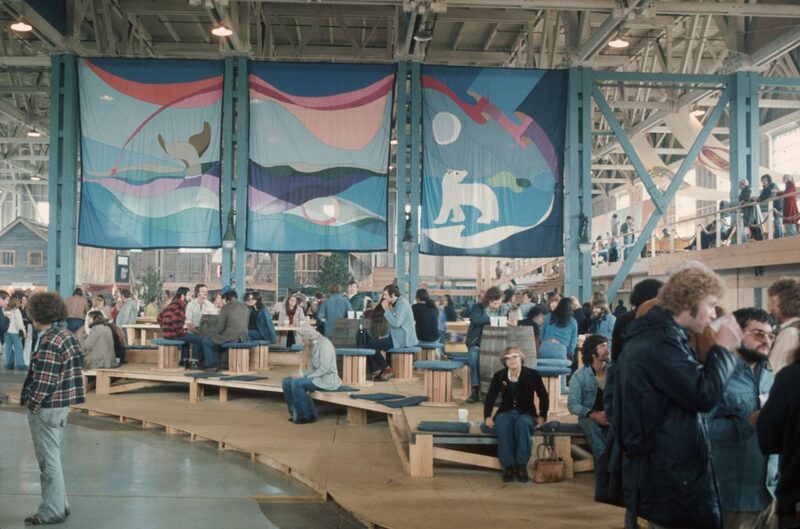 With a secondhand portable sawmill, some horses to haul driftwood from the shoreline, wharf railings that came from the Lions Gate Bridge, and a crew of employment-grant rehab cases, he built a people’s forum to parallel Vancouver’s landmark 1976 United Nations Habitat conference on human settlements. In time, Habitat Forum became better known than the international Conference which inspired it (even as the latter continues periodically in different parts of the world). In Hangar no. 7 a social centre and bar were installed. The bar, built of attractive blonde and tan wood as much of the interior was, was at the time said to be the longest in the world. Despite the spare construction an atmosphere of amity and warmth was conveyed, in tune with the wider environment – at least it’s one way to achieve it. 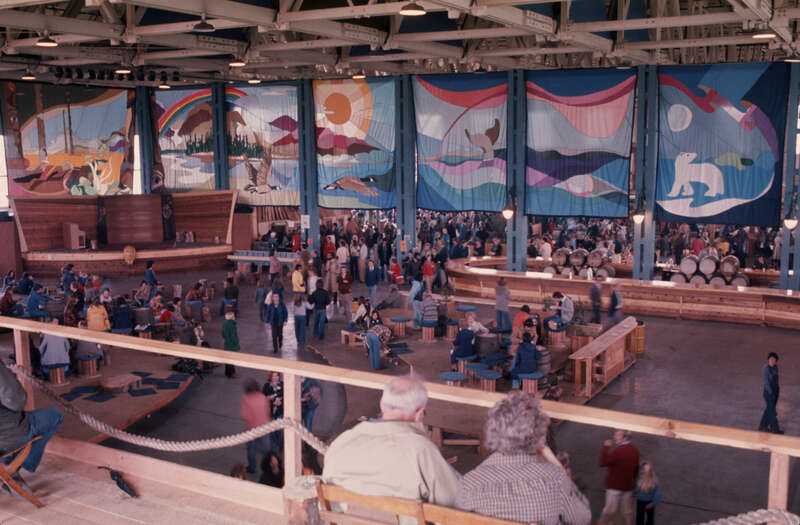 The serenity was enhanced by the beautiful murals, probably by the famous Canadian artist Bill Reid. Reid was a broadcaster, jeweler, and artist of partial aboriginal West Coast (Haida) ancestry. Some of his work decorates Canadian currency. The black-and-white shot shows an intriguing pile of wood barrels in the centre. Did these hold beer? The photo caption states that “tankards of ale” were dispensed, yet the shots of people holding and being served beer suggest standard Canadian blonde beer was served. Did the barrels, or some of them, contain whisky? This seems unlikely. Vancouver’s civic ethos was not quite as uninhibited as today and the long history of Canadian temperance and irregular prohibition, not far behind. I think it is more likely the barrels held wine. In fact, one of the images shows barrels marked “Andres”, a venerable winemaker with a pan-Canadian history. One barrel seems to state “Tilford” though, probably from Park & Tilford, a Canadian whisky brand. Also, some shots show bottles of wine on the bar, so wine from the barrel would seem unneeded unless both forms were available. If some beer was sold from the wood, perhaps a brew was specially made for the event. If so this would pre-date any modern craft barrel-aged beer in Canada. Hipsters of 2018 will approve the plaid jackets and shirts, exactly like today’s, and the beards. In many ways the 60s-70s really were The End of History. And it started here, or a lot of it, arguably. 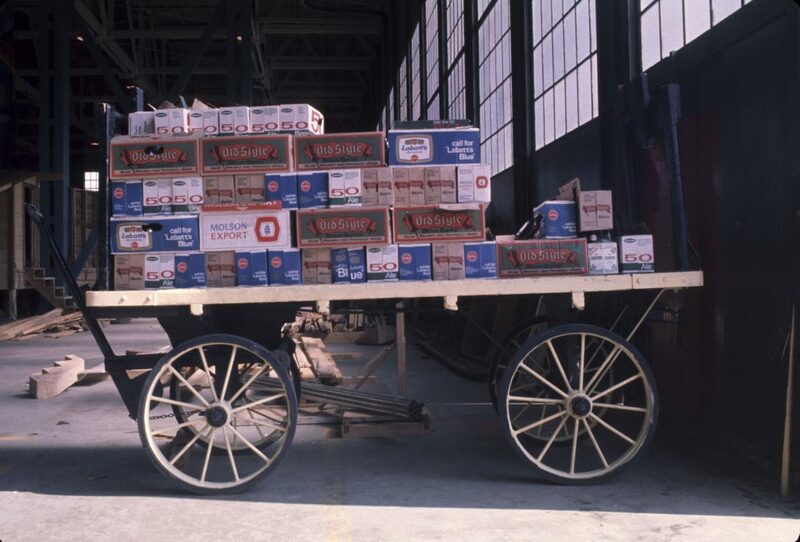 As to the pile of parti-coloured beer cases on the old-fashioned cart, it’s old-school all the way: no craft beer was available back in ’76 except any bubbling in hippies’ basements or Frank Appleton’s mind. Appleton is the early, influential British-Canadian craft brewing consultant, I’ve written of him before. Every single one of those brands is available today, 42 years later. Some don’t sell as well as back then, but you can still get them. If you put the modern cases on a cart they’d look almost exactly the same. In contrast, the hangars and interiors were demolished after the event at the instance, apparently, of the Vancouver Parks Department. Nothing remains. Vancouver to this day retains a rebellious, anti-establishment spirit. It mixes oddly perhaps with the town’s sky-high home prices and big money business and social circles, but there you have it. A lot of that spirit started around the time these images were taken. Note re images herein: The black and white image was sourced from the City of Toronto’s archival photo collection, here. The remainder were sourced from the City of Vancouver’s photo archive on Habitat Forum 1976, see here for the group of 31 images pertaining to Hangar no. 7). All intellectual property in the images belongs solely to their lawful owner, as applicable. Images used for educational and historical purposes. All feedback welcomed.